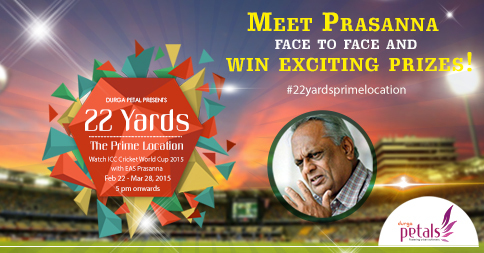 In the spirit of nurturing the young at heart and the younger ones and to inspire them to play and learn the technical aspects of Cricket, Durga Projects is inviting the legendary spinner Padamshree EAS Prasanna at the Petals Experience Center to interact with his fans. EAS Prasanna will be visiting the Petals Experience Center on all India match days as well as in the Quarters, Semis and Finals of the ICC Cricket World Cup. This is an open event and everyone is invited to meet with EAS Prasanna, watch the match highlights and analyze it along with him. The first such event was held on 22nd Feb, on the day of India Vs. South Africa match. It was an excellent evening with the very young at heart EAS Prasanna. The celebrations were even more special as it was the first victory of India over South Africa in the ICC World Cup. The Durga Petals team organized a quiz around the life and achievements of Shri Prasanna as well as interesting facts around World Cup. The entire event was very interactive with Shri Prasanna answering all kinds of questions from the large number of people who turned up for this wonderful evening. The questions ranged from the current form of Indian cricket team to technical aspects of bowling to even the most difficult format of cricket today. Everyone participated in the quiz with enthusiasm and with the hope to win amazing prizes. The second prize in the Cricket Quiz was won by a very young cricket enthusiast of just 8 years of age and he was given a personally autographed ball by Shri Prasanna which can only be an inspiration to our new generation. The first prize was won by a huge fan of Shri Prasanna and was absolutely delighted to win an autographed bat from him. The evening culminated after the entire crowd had snacks and tea and had another opportunity to have an informal chat with Shri Prasanna. The next event is scheduled for 6th March with a very exciting India vs. West Indies match at hand. The future of Indian cricket is bright and this is a small gesture from Durga Petals to inspire all cricket enthusiasts. Durga Petals is an upcoming project from Durga Projects in the prime location of Marathahalli Outer Ring Road, the heart of Bangalore’s IT corridor with proximity to major IT companies, educational institutes, shopping malls and more. Spread on 5 acres of land, Petals boasts of 8 luxurious sky soaring towers. And that’s not all; it has a sprawling club house and 40+ recreational amenities. For more details on the project, please visit http://www.durgaprojects.in/petals or call+91 9019555777. < Should I buy a 2 BHK or a 3 BHK apartment? Walk to work, a new delightful proposition! How Multiple Amenities Add More To Your Purchase .